This highly-trafficked loop is reminiscent of a small-operation ski resort – there is something for all levels of downhill riders. One could easily spend the whole day shuttling this route, warming up on greens, careening down blues, and bombing blacks. 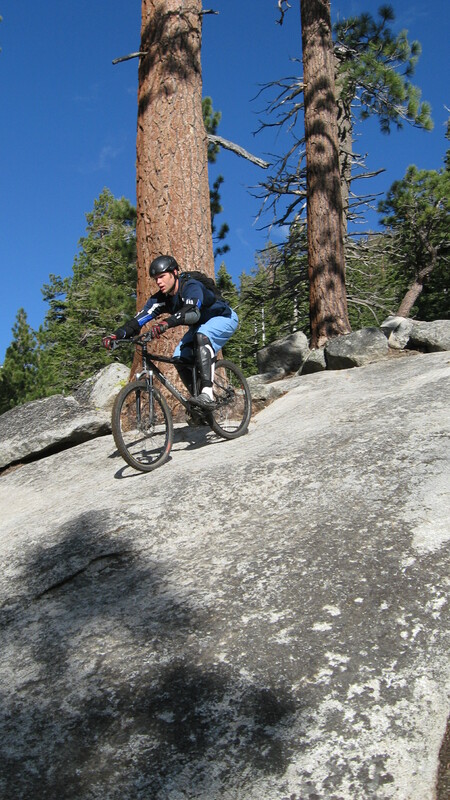 Situated at a lower elevation than most South Lake Tahoe singletracks, Corral loop is one of the first mountain biking trails to open after snowmelt, creating a long riding season for this Meyers gem. 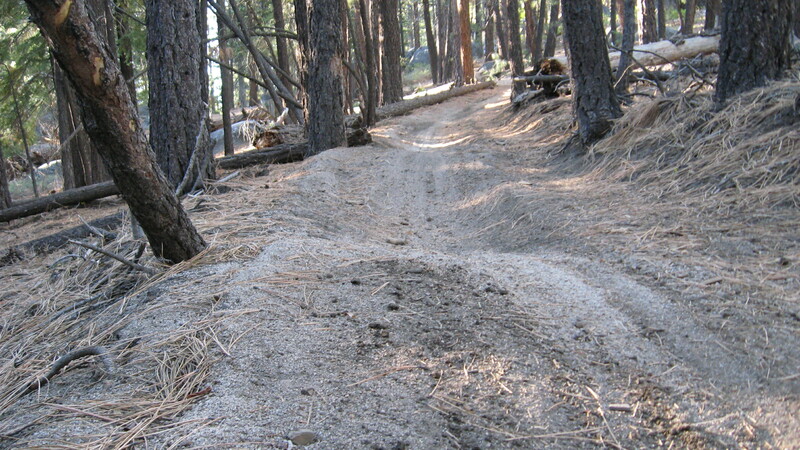 Initially a hard-packed trail in the springtime, Corral gets pounded to a fine dust by the end of Indian summer. 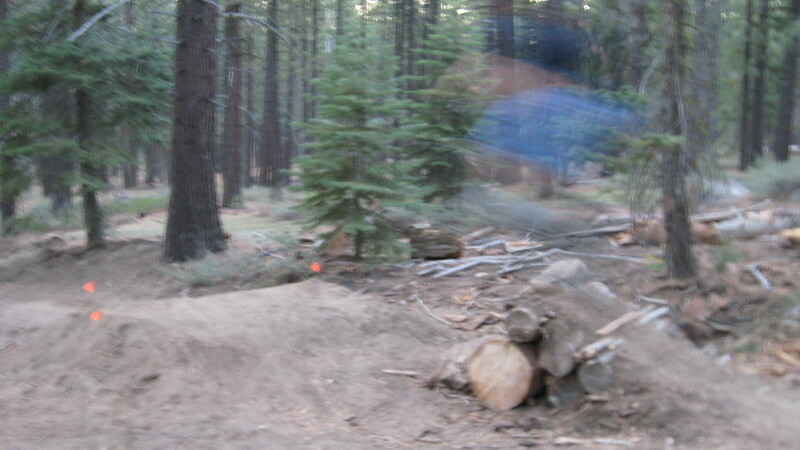 Fortunately, during this 2009 fall season, El Nino rains have graciously swept over Corral Loop, transforming quicksand into dirt nostalgic of early season conditions– a circumstance which paints a Cheshire cat-like grin on the faces of local mountain bikers. 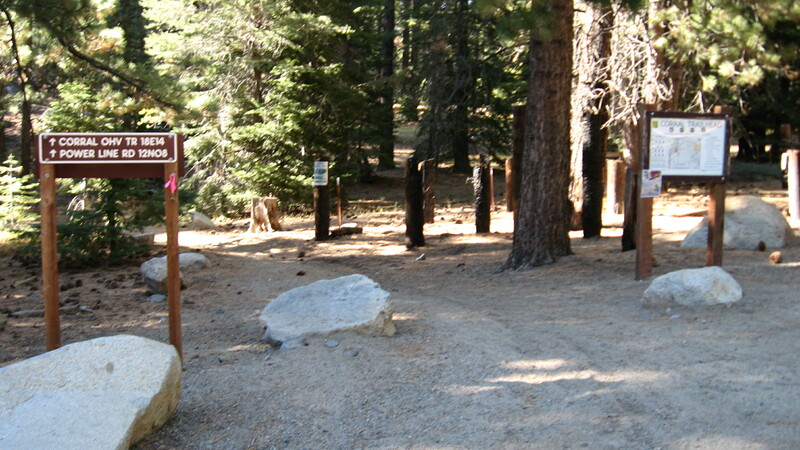 From Meyers, take Highway 50 north and turn right onto Pioneer trail toward South Lake Tahoe. After 0.8 miles, turn right onto Oneidas Street. Oneidas ends at an opened Forest Road gate and turns into a rough, single-lane road, known as Fountain Place Road. Follow Fountain Place Road to the large dirt parking lot on the left, before the pavement curves right and starts its two-mile ascent to the Corral trailhead. In the parking lot, you will find a tailgate party of Corral enthusiasts (especially on the weekends), both mountain bikers and dirt bikers. From the parking area, shuttle or bike up a short, 2-mile stretch of Fountain Place Road. After passing through a cattle grade, Corral trailhead is located on your left. For ambitious riders yearning for more miles of technical singletrack, continue up an even steeper section of Fountain Place Road for 1.2 miles to its bitter end, where Armstrong Pass trail is located on the right-hand side and challenging Connector trail dumps off to the left. 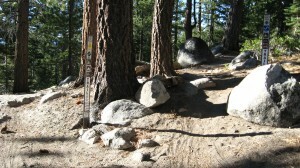 About 100 feet onward from the designated Corral trailhead, there is a fork in the singletrack, tracing a more technical Corral trail to the left and intermediate-style Sidewinder trail to the right. Choose your destiny, knowing that with either decision, pure elation lies ahead. Corral immediately drops into sections of rock staircase, although in comparison with Mr. Toad’s Wild Ride, these granite stair steppers are not nearly as long or as steep, excluding one 100-yard rock garden. Such rock-strewn jaunts are benignly interspersed with long dirt straight-aways. 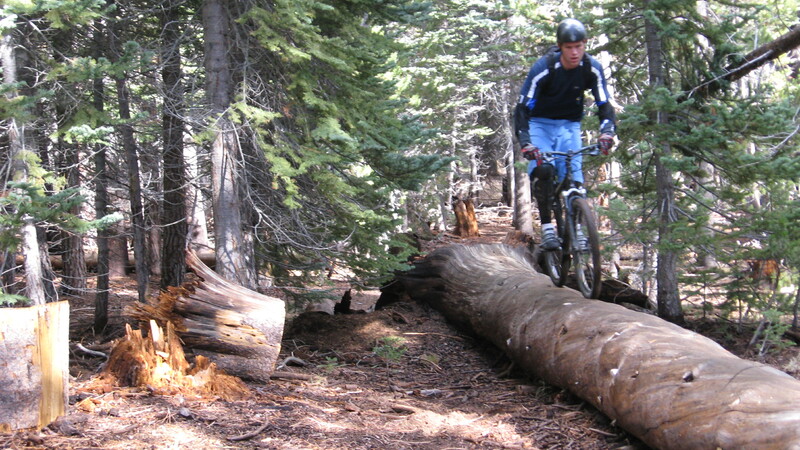 If you fancy log stunts, keep your eyes akimbo for some technical tightrope acts sidelining the entire 2-mile singletrack stint that is Corral trail. After its last rocky portion, Corral trail merges with buddy Sidewinder trail right before a wooden bridge, crossing over a bubbling Trout Creek. Expect a short climb post-bridge to a marked fork, which indicates the continuation of Corral trail to the left and Cedar trail to the right. 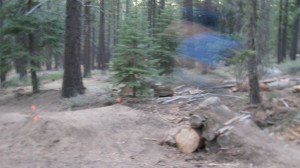 Thereafter, Corral trail navigates its way through open forest on log-littered pathways and long straight sections of dirtbike-spawn whoop-de-doos. 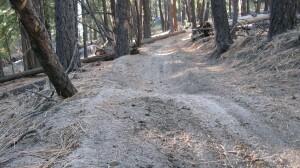 In the summer months, the last half-mile of Corral can get quite sandy, benefiting bikes with beefy tires. Recently, a team of local mountain bikers put some blood, sweat, and tears into the bottom of Corral trail, building an optional byway, coated with 10 and 15-foot kickers followed by sweet, soft dirt transitions. Corral Trail empties out onto a dirt road, known as Powerline Road. Turn left and cruise for 0.9 miles along sandy, bonus whoope-de-doos, over a paved bridge crossing Trout Creek, and on a gravel road back to the Fountain Place parking lot. Sidewinder Trail is the right-hand split off from Corral trail, very close to the trailhead. Initially, Sidewinder ascends up and over small boulders, yet once the short semi-technical climb is over, the trail takes on a persona that lives up to Sidewinder’s name. Snake through 47 (yes, I counted them) smooth, berm-like bends, noting some beginner, ride-on, ride-off logs along the way. Advanced riders, don’t miss out on the technical log stunt midway down the trail, which stretches for about 40 feet of colossal pipeline and cuts off a couple turns on Sidewinder’s 1.2 mile, serpentine singletrack. Right after Corral trail crosses a wooden bridge, the right-hand branch for Cedar trail presents itself. Downshift for Cedar’s initial soft climb and then pedal through 2.0 miles of rollers, peppered with whoop-de-doos and banked curves. 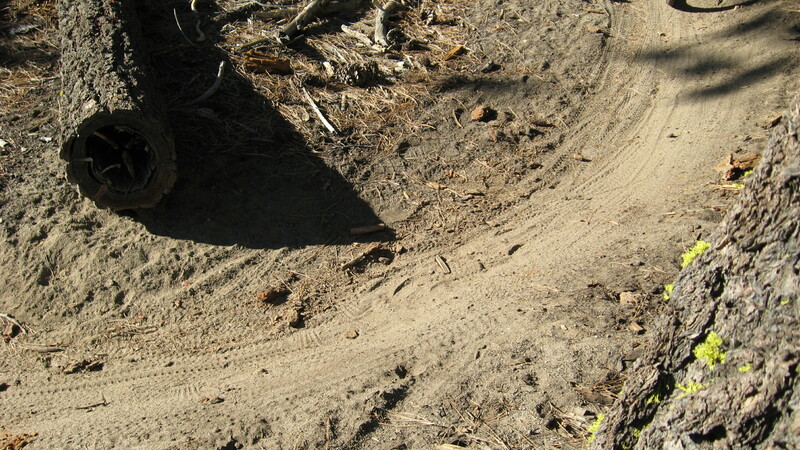 The trail appears very smooth, albeit sandy, and its string of rolling hills prevents any mountain biker from reaching high velocities. In this fashion, Cedar trail owns up to its beginner status. 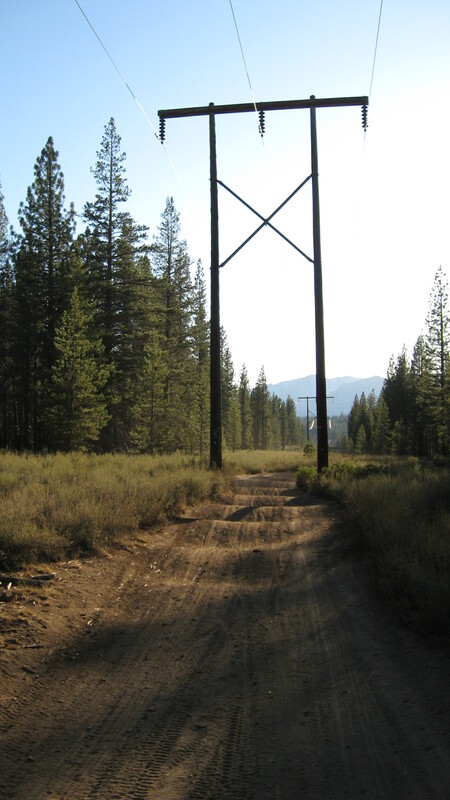 Cedar trail fuses with Powerline Road, about 0.7 miles from the Corral trail junction. Turn left for a parking lot-bound, rolling section of double-lane dirt road. 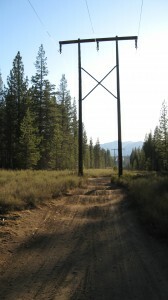 The abundance of whoop-de-doos on both climbs and descents, suggest that off-highway vehicles frequent this segment of Powerline trail. Connector trail both starts and ends with a more or less flat, shaded pathway lined with towering pines. Its midsection gives Connector its intermediate to advanced character. Switchbacking its way down a mountain, the middle half of Connector trail meanders along an open, boulder-caked cliffside. 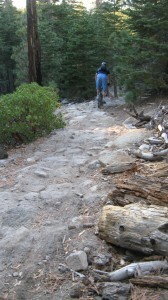 In the heat of summer, this exposed portion of the trail can acquire a sandy texture. Expert riders, observe that the trail splits for a short stint and merges again. Taking the upward fork will allow one to drop down a long, polished slab of granite back onto the main trail. 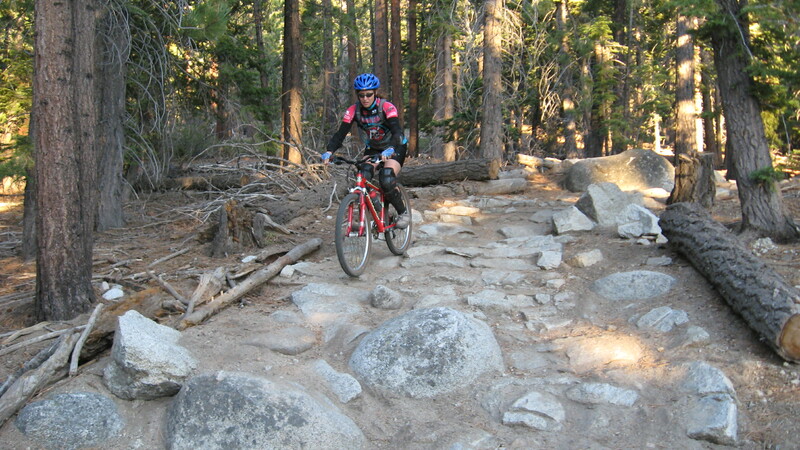 Connector trail, 1.4 miles in length, conveniently dumps out at the Corral trailhead, allowing long-distance mountain bikers to connect Armstrong Pass to Corral Loop. I just did this ride today (up to Armstrong pass). Maybe I should have read this first.